If you’re looking for a subcompact city car, you’ve probably noticed that it’s hard to find one with the features and content that make a small car enjoyable to drive, while still maintaining a low price. Enter the 2019 Chevy Spark, a popular subcompact sold all over the world since 1998 but making its debut in the USA in 2009. It has all the style and creature comforts you’re looking for in a daily runabout, while still offering the value you demand, starting at just a hair over $14,000. Compounding that value is impressive fuel economy at 29/38 city/highway EPA gas mileage, a spacious cabin capable of holding 27.2 cubic feet of your cargo, and a simple, naturally aspirated powertrain that offers better reliability with less moving parts. Fans of the Save the Manuals movement will appreciate that the 2019 Spark can be had with a 5-speed manual transmission, regardless of trim level. 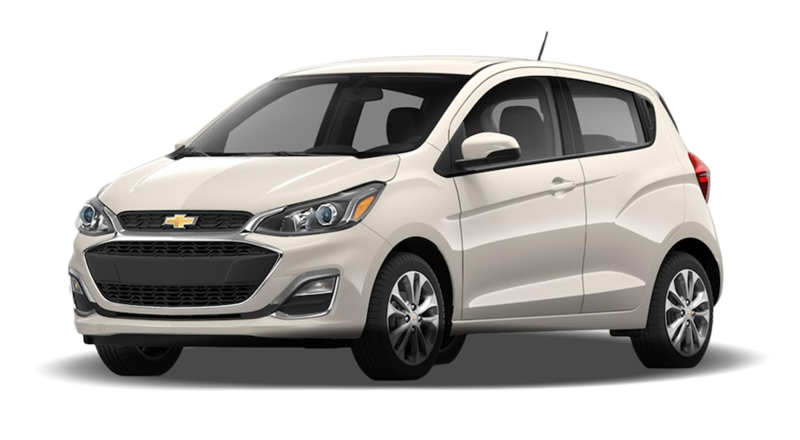 For 2019, Chevy has given the cheerful Spark a facelift, with new Chevrolet MyLink infotainment system, new front and rear fascias, new colors like Caribbean Blue Metallic and Red Hot, and Automatic Emergency Braking offered on select trims. The revamped Spark will be hitting dealers around this time. If you’re concerned about safety in such a small car, rest assured that Chevy has thrown mountains of safety tech at the Spark to make it a standout in its class. A standard rearview camera and 10 airbags are complemented by Forward Collision Alert, Lane Departure Warning, and Rear Park Assist, as well as Apple CarPlay and Android Auto to cut down on distracted driving. Speaking of in-car tech, the Spark also boasts an available 4G LTE Wi-Fi network, multiple USB ports, and the available myChevrolet mobile app, all powered by a 7-inch touchscreen infotainment system. No matter whether you’re looking for space, efficiency, value, or trouble-free operation, the 2019 Chevy Spark has you covered! So, let’s take a closer look at what this incredible vehicle has to offer in a few of the most important automotive categories including safety, trim levels, and practicality. When moving at speeds between 5 and 37 miles per hour, your Spark will detect impending front-end collisions, automatically apply the brakes, and attempt to reduce the severity or prevent entirely a front-end accident. Building on Low Speed Forward Automatic Braking, Forward Collision Alert operates at all speeds and constantly keeps an eye on traffic in front of you. If it detects a potential front-end collision, it will give you an audible and visual alert warning you to apply the brakes. This system is designed to protect against unintentional lane changes. When the turn signal is not activated but the Spark detects it is leaving its intended lane, it will provide a warning to the driver to correct course. It will not, however, attempt to move you back into your lane. Ultrasonic sensors mounted to the rear of your Spark will give you alerts should you get too close to a stationary object while backing up. This standard safety feature activates automatically in reverse to give you a picture of your rear surroundings on the Spark’s infotainment screen. It’s almost impossible to consider this a base model - gone are the days of subcompact cars being penalty boxes with manual steering, manual mirrors and stiff seats - the Spark LS positively coddles its occupants with standard features such as Bluetooth integration, Siri Eyes Free, and multi-position front sport seats. Practical touches include a split folding rear seat, a rear center console, automatic headlights, power steering, and a rear spoiler. Standard safety features include StabiliTrak electronic stability control with traction control, Hill Start Assist, Daytime Running Lamps, 10 airbags, OnStar, and a Tire Pressure Monitoring System. Spark features MacPherson struts in the front suspension and a compound crank suspension in the rear. Four-wheel antilock disc brakes bring everything to a stop in short order should the need arise. Building on the solid bones of the Spark LS, the 1LT trim adds alloy wheels, power door locks, windows, and mirrors, remote keyless entry, cruise control, and audio controls mounted on the steering wheel. A six-speaker audio system combined with 3 free months of SiriusXM satellite radio helps make sure the party never stops! A new offering from the Spark lineup is the Spark Activ, offering a bold, off-road ready look ready for your active lifestyle. Adding to the 1LT trim, Activ offers a raised suspension, heated leatherette seats, lower body cladding, revised fascia, fog lights, roof rails, and a leather steering wheel. This trim is a step up from the 1LT, adding heated leatherette seating, unique alloy wheels, exterior chrome accents, keyless open and start, rear park assist, a Driver Information Display in the instrument cluster, and a leather steering wheel. The Driver Confidence Package adds Forward Collision Alert, Lane Departure Warning, and Low Speed Forward Automatic Braking for the outstanding value of $295. Subcompacts have not historically been known for their practicality. Always having been built as mere appliances, they were meant to get you from point A to point B as cheaply as possible. This meant skimping on creature comforts and basic necessities, being built to a price point with the cheapest materials possible. Chevy envisions a different goal for the 2019 Spark, one in which satisfaction is the ultimate goal, not cost per unit. They believe “cheap and cheerful” does not have to be punishing and austere. The Spark was built to offer an urban runabout that offers all the features and content of a larger car, without the extra weight and size that hampers maneuverability. The Spark’s diminutive size on the outside masks the efficient and spacious interior within. A height of 58.4 inches (58.8 in Activ trim) guarantees drama free entrance to low clearance parking structures and garages, while a tight turning radius with a short 143-inch length makes parking and u-turns a breeze. Front occupants are treated to 39 inches of head room and 41.7 inches of legroom. Rear seat passengers aren’t left out, offering 37 inches of head room and 33 inches of legroom. 27.2 cubic feet of cargo space, coupled with 60/40 split fold-flat rear seats and a rear cargo security shelf keep cargo safe and secure. Interior storage abounds with a glove box, a map pocket in the front passenger seatback, storage in the instrument panel and a storage tray in front of the passenger. Total interior volume is an impressive 83 cubic feet, with all of this storage and practicality coming in at a svelte 2,300 pounds, contributing to Spark’s top tier efficiency. Spark’s nine-gallon fuel tank offers a highway cruising range of up to 342 miles. Spark comes standard with a 1.4 liter ECOTEC four-cylinder engine, coupled to either a 5-speed manual or a Continuously Variable Transmission (CVT). Front wheel drive ensures optimum efficiency, complementing Spark’s economic powertrain offerings. At McCluskey Chevrolet, we aim to treat every new car purchase as a special occasion and make the process as easy and enjoyable as possible. When it’s time to jump into the subcompact car market, everything you need is at your fingertips through our easy to navigate website. When you’re ready to stop by and see us, we offer services from the beginning of the process to after delivery - financing, advice, maintenance and service, all in one place! At McCluskey Chevrolet, we listen to your needs to help you decide which of our innovative and unique vehicle offerings is right for you. On a tight budget? Not a problem! We respect your budget to help you find a path to your new dream car. If you’re ready to shop, we are ready to serve! Our next level customer service is second to none, and we are happy to take you on a tour of our award winning dealership. If you are still on the fence, come speak to a member of our helpful and friendly staff. We are positive that you will feel appreciated and respected at McCluskey Chevrolet.